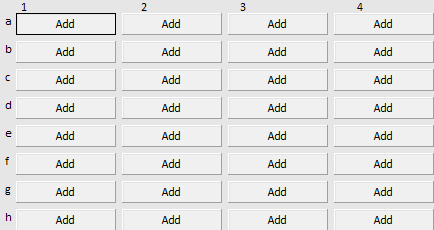 Grid with same named buttons - how to click individually? I have a grid with several buttons (a kind of dimension picker) which are named the same. Now say I want to press the Add button on 3e - see attachment - eggplant seems to find the first add button and click it. I've already tried setting the hot spot but it doesn't seem to work. Is there any other way to count through the buttons? My selection is always based on both the horizontal and vertical options. If you can find the location for the vertical (a, b, c, d, e, f, g, h) and horizontal (1, 2, 3, 4) gradation you can use that to calculate the position of the desired button.